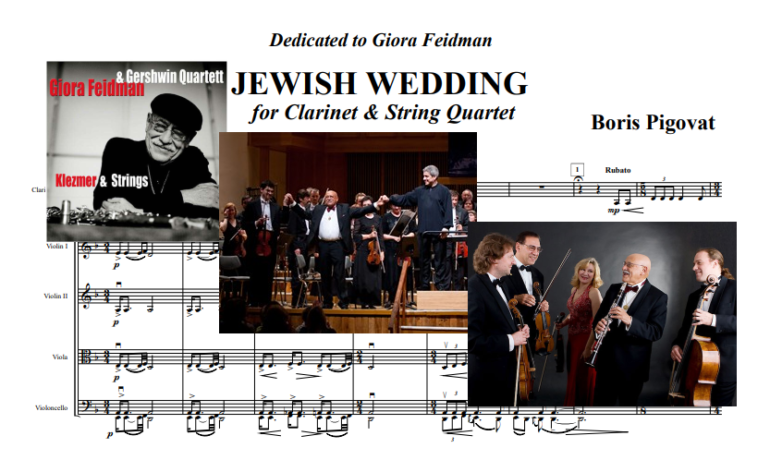 In 2001 I met Giora Feidman, a world-wide famous clarinetist and performer of klezmer music. He gave me a couple of his CDs. I was so impressed by his performance, that I decided to write a piece in klezmer style, a kind of klezmer rhapsody, and to dedicate it to him. As a composer-in-residence at the Petach-Tikva Conservatoire, I was committed to write a piece for trombone and wind orchestra. I decided to write this piece as a klezmer rhapsody and to name it Tzfat (Safed), the name of a city where klezmer music festivals take place yearly. Tzfat for trombone and wind orchestra was written and performed in 2002 (see recording, below). In 2004 I prepared a version of Tzfat for violin and string orchestra, which was also performed (see recording, below). In 2008 I met Giora Feidman again, and he listened to Tzfat. He loved the composition, and he asked me for two additional versions of it: one for clarinet and string orchestra and another for clarinet and string quartet. He also suggested to rename the piece to Jewish Wedding, arguing that, outside of Israel, people are unfamiliar with Tzfat. The version for clarinet and string orchestra was performed by Giora with a string group of the Jerusalem Symphony Orchestra (see recording below). The version with string quartet was performed the with Gershwin Quartet more than 30 times – in Germany, Austria, Holland, Switzerland, Russia and Ukraine. See below for a YouTube video from a performance in the Berliner Philharmonie concert hall. In Israeli Sketches, a suite for wind orchestra, I re-used Tzfat content, but made it purely orchestral without any solo instrument. Looking back to 2001, when I met Giora Feidman for the first time, I could not have imagined such exciting developments!